A Bosnia and Herzegovina Travel Experience Comes Highly Recommended! Are you travelling to Europe and considering a trip in the Balkans? Perhaps you’re thinking of Bosnia and Herzegovina – but don’t quite know enough about it? We were there once, too! Bosnia and Herzegovina is quickly becoming a travel destination that is calling travellers in. From the historical Mostar to the capital, Sarajevo, Bosnia and Herzegovina is a complex and beautiful country with a difficult past. Lots of people wonder if travelling to Bosnia is worth their time. We think so! Whether you’re looking for war-time history, nature, or classic tourist attractions, Bosnia does have it all. So, we’ve written a guide on our first impressions and general knowledge about the country. 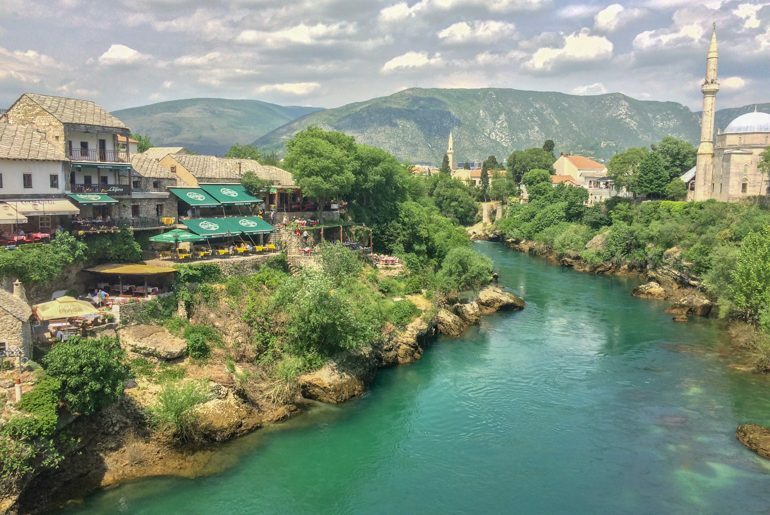 From the currency used in Bosnia to tourism and safety, we cover things you need to know about visiting and our experience in Bosnia and Herzegovina. You can’t talk about the visiting Bosnia without first (briefly) discussing and understanding the complex history of this region of South Europe known as the Balkans. The region was once the location of a country called Yugoslavia. Anyone in an older generation will be familiar with this region being called Yugoslavia. The country (for lots of reasons) began a slow break up from 1991 into what we have today: 6 independent countries and a disputed territory. The result was numerous interconnected ethnic and political wars that raged on (for complex reasons) in different parts of the former Yugoslavia. Some of the worst fighting occurred between 1992 and 1995 in what is now known as the Bosnian War. The Bosnian War was fought primarily over ethnic differences between three main groups in Bosnia. Bosnia’s capital Sarajevo was under siege for years, the country was divided, and many died or were displaced. 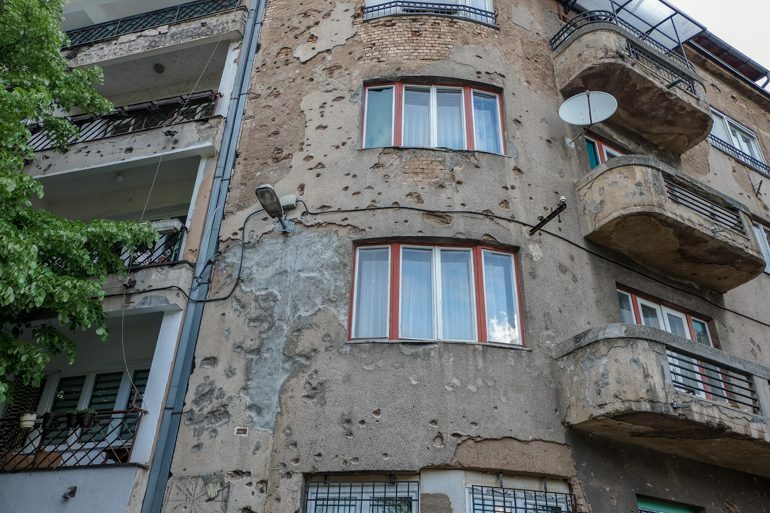 The scars of war are still very much visible in Sarajevo. In 1995, the war accumulated into an act genocide at Srebrenica which is recognized as the turning point where the international community intervened to stop the war. After outside intervention (bombing), peace talks happened, the fighting stopped, land was divided into what Bosnia and Herzegovina is today. The country, in many ways, feels divided yet oddly peaceful. Now, obviously it’s stupid and almost offensive to try and cover the Bosnian War in like four paragraphs but we tried our best. As a traveller, we feel strongly that you should understand Bosnia’s past because while the country is safe today, the past plays a huge role in shaping the current identity of Bosnia. If you want to understand more about the region, travelling to each of the countries will offer you a differing perspective than the one before. The break up of Yugoslavia has lingering effects on Croatia, Montenegro, and the other Balkan countries/territories like Slovenia, Macedonia, Serbia, and Kosovo. We went from Split to Sarajevo, Sarajevo to Mostar, then Mostar to Dubrovnik. Just a sampler of the country. Having been there, we now know that there are SO many other places we want to check out in Bosnia. However, we’re glad we even made the decision to go there in the first place – that leg of the Balkan trip was a last-minute addition. The bus ride from Split, Croatia into Sarajevo was long but pretty. The beginning of the trip was a little odd with a miscommunication with the driver but we were both at fault, it didn’t matter in the end, and the rest of the trip was fine! You can read about the whole experience (including routes and prices) in our bus ride from Split to Sarajevo post. Sarajevo is a beautiful city to get lost in. Like most travellers heading there for the first time, we had no idea what to expect other than what we had heard or seen from the past. Not a ton of Canadians or Germans (that we know) just up and travel to Bosnia. Well, we do! Honestly, we loved it. Learning about the past in Sarajevo was fascinating and sobering at the same time. My honest opinion (and this is Eric speaking now) having travelled to just shy of 50 countries: Sarajevo was the first place in a long time that actually “wowed” me. It was different, unique, and beautiful – all at once. Lisa was also super impressed by the city. 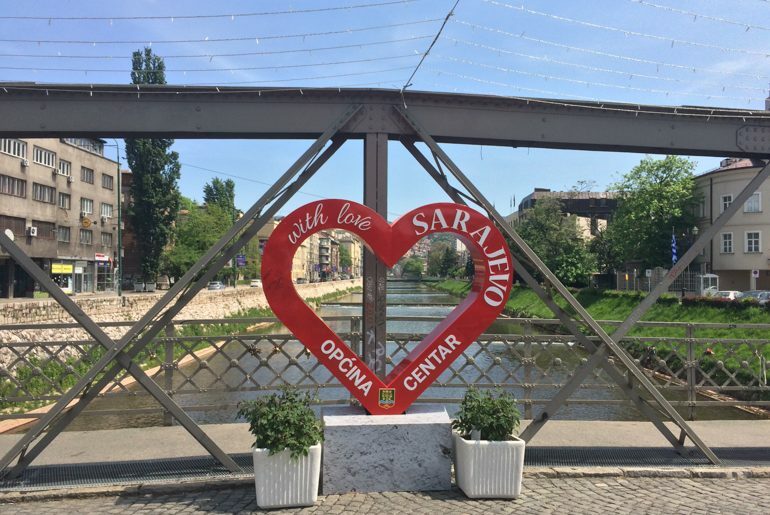 If you want to learn more about our time in Sarajevo and what to do, here’s our post on things to do in Sarajevo! We also tried amazing Bosnian foods and wrote a guide on our favourite restaurants in Sarajevo’s Old Bazaar! From Sarajevo we took the train to Mostar. Now, this train ride is known to be very beautiful as you go through the mountains and lush green hillside. In all honestly, it was nice – but certainly not as spectacular as other blog posts had made it out to be. That said, we went to the train station in advance of the date to buy the train tickets. This proved to be smart because we (unknowingly) travelled to Mostar on a holiday weekend and the train was packed. The mighty Neretva River carving through Mostar heading to the Adriatic Sea. We had an incredible time in Mostar. 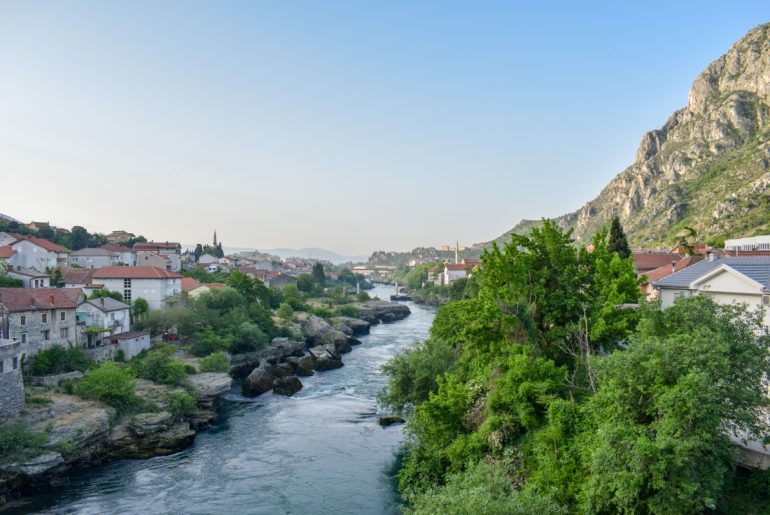 The food, the landscape, the people – everything about Mostar was great. The only thing that was noticeable were the tourists. Since Mostar is about 4 hours from Dubrovnik, the town sees a TON of day trippers on buses looking to see the bridge and the Old Town before returning to Croatia later in the evening. Totally understandable, just very busy! Since it made the touristy centre of Mostar (by the river and bridge) very busy mid-day we just avoided it. We combatted this by getting up at 6:00 am to get pictures and the Stari Most all to ourselves. We even made a video about it! For the full guide on Mostar, we wrote a things to do in Mostar post which you can check out! In terms of the last bus out of Bosnia, we went from Mostar to Dubrovnik which is a very well-traveled route. This ride was nice and very uneventful – except for the multiple border crossings. 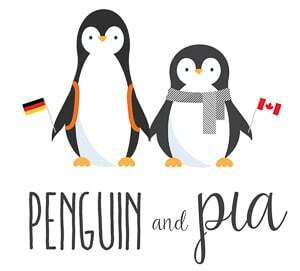 Even though we were travelling in May – which was the off-season – we had to wait at the border. We can’t imagine what June through August must be like for buses and travellers heading in and out of Croatia through Bosnia in the south! We wrote all about this bus journey from Mostar to Dubrovnik if you want to check it out! Finding a place to stay in Bosnia and Herzegovina shouldn’t be too difficult. That said, you’ll have a variety of hotels, guesthouses, and hostels to choose from in each city or town. Comparatively, Sarajevo is a “large” city and so there are lots of hotels as well as guesthouses. We stayed in a guesthouse and we enjoyed our stay – which was a quick walk to the centre. 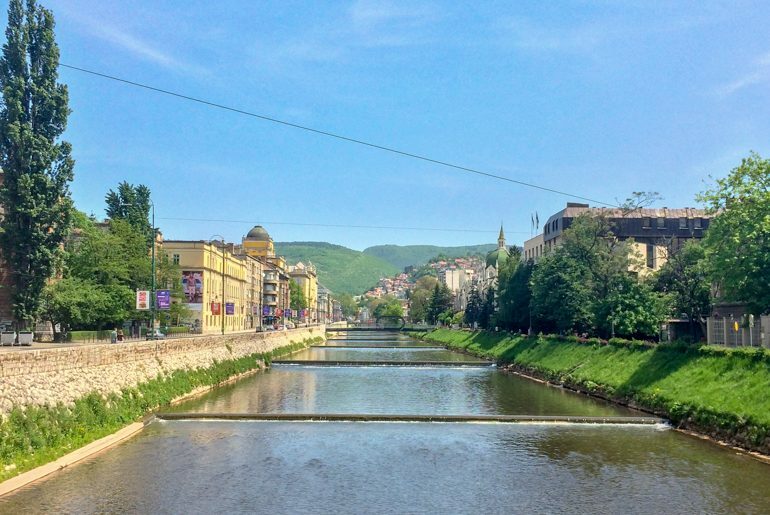 If you need a place to stay, you can get started looking for hotels and guesthouses in Sarajevo here. Mostar is a little smaller but there are still nice hotels, a brand new hostel, and guesthouses all over the place. We liked our guesthouse stay and would recommend a private room in a guesthouse if you aren’t too picky. If you are looking to book your stay in Mostar, then use this link to get started searching for a hotel or guesthouse in Mostar. From a bridge in Mostar, you can see the mountains in the background. We got around Bosnia and Herzegovina by bus and train. We don’t usually rent cars so these options worked best for us. If there’s one thing we have learned, however, it’s that Bosnia (and outside Mostar, for that matter) is the place we wish we HAD rented a car. The reason for this is that there are lots of small villages, waterfalls, and other natural attractions in the area that are hard to get to without a car. As far as roads go, the highways were well-paved and the bus drivers were safe and responsible. No complaints from us transportation-wise. Bus stations are like many others in the Balkans. Many platforms, a ticket counter and sometimes a cafe. Just watch for the signs that indicate routes in the front windshield of the bus. Pretty simple. Bosnia and Herzegovina, in our opinion, is safe. In fact, we felt safer in Bosnia than in some other Western European countries. There’s a peaceful calm about the place. The war ended many years ago – and while the scars are still very visible in places – the country is relatively safe. One of the more serious considerations is if you are hiking in the country. While many of the rural areas have been de-mined, there is still a very real chance of land mines that were buried during the war and haven’t been cleared. We felt very safe in Sarajevo. We also heard that bandits used to roam the mountain Trebević above Sarajevo near the closed down cable car as there are hiking trails and whatnot. However, the cable car has since been reopened (after 26 years) and the area is redeveloping so that locals and tourists alike can return to enjoy the views and the former site of the 1984 Winter Olympics – including the closed down, graffiti-covered bobsled run. Our tour guide in Sarajevo told us the story of how (not too long ago) she had a traveller email the tour company asking “are there still snipers in Sarajevo?” She replied with something to the paraphrase of “well, it’s been over 20 years and no snipers yet so I think it’s safe”. Just goes to show that people still mainly know Sarajevo from the news 20 years ago. As for tourists, normal safety precautions are required. We didn’t feel like we would be a target of a pickpocket in the busy Bazaar in Sarajevo but the tour guide told us to be aware of our pockets. Honestly, we do this anyways and (knock on wood) we’ve never been pickpocketed. 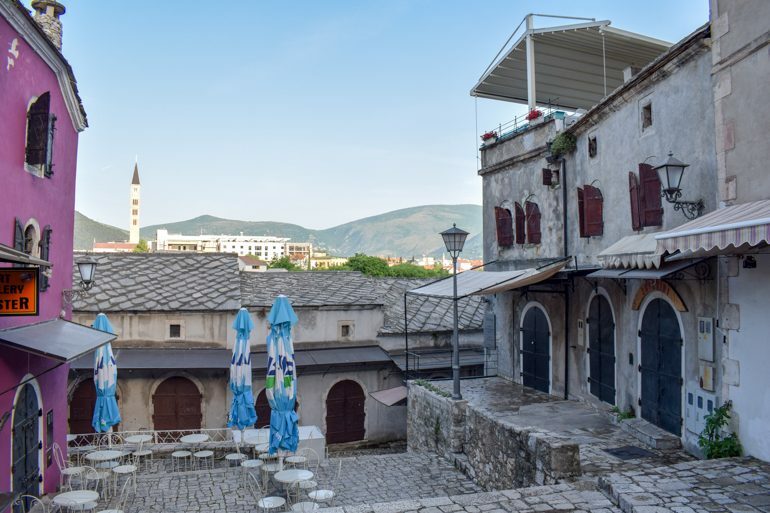 The Old Town market in Mostar – before the shops open early in the morning. As yes, another currency to collect! The currency used in Bosnia is the Bosnia Mark. It is double the Euro – so 1 Euro would be 2 Bosnian Mark – which made it easy to work out the conversion in our heads. Prices in Bosnia are also relatively cheaper compared to Western Europe and even neighbouring countries such as Croatia. It’s approximately 2 BM to get a coffee (espresso). Breakfast burek was less than 2 BM at the corner bakery and it was hot and fresh. A full dinner with drinks at a middle-priced restaurant that left us very full in Sarajevo was 40 BM and in Mostar was 37 BM. So, pretty cheap – and the quality of food was great! Bosnia and Herzegovina has a fascinating and confusing culture. With so many influences/rulers over the past centuries, there a mix of influences in architecture, music, language, food, and more. This is where it’s important to tell you that Bosnia is made up of three distinct ethnic groups: Bosnian Serbs, Bosnian Croats, and Bosniaks (Bosnian Muslims). Overall, the people we met were kind or didn’t care you existed – but in a good way. Kind of indifferent. Unlike in Croatia, where the locals (in some places) have become annoyed by the tourists. One of the first observations we had was that Bosnia had a great coffee culture. There were loads of cafes in Sarajevo that were always packed – even at midday during the week. We then went on the walking tour and realized this was because the country had an unemployment rate of over 40%. This is largely caused by the government/running of the country. In the countryside, it was kind of different. The people we saw in the countryside were working, or building, always doing something. In short, we got the impression that people in Bosnia are industrious, similar to our experience with people in Romania. It’s no secret that religion plays a role in everyday life in Bosnia. In fact, religion (among many other intertwined factors) was sort of one of the drivers of the war in the first place. That’s a discussion for another day, though. The view from the Stari Most in Mostar – with mosques dominating the eastern side of the river. Sarajevo is a city that is religiously divided but they still co-exist. It’s fascinating. There are still many places of worship from all the different religions in Sarajevo. Sarajevo, of all places in Bosnia, has tried to make a point to be open and welcoming to difference after such a brutal civil war. 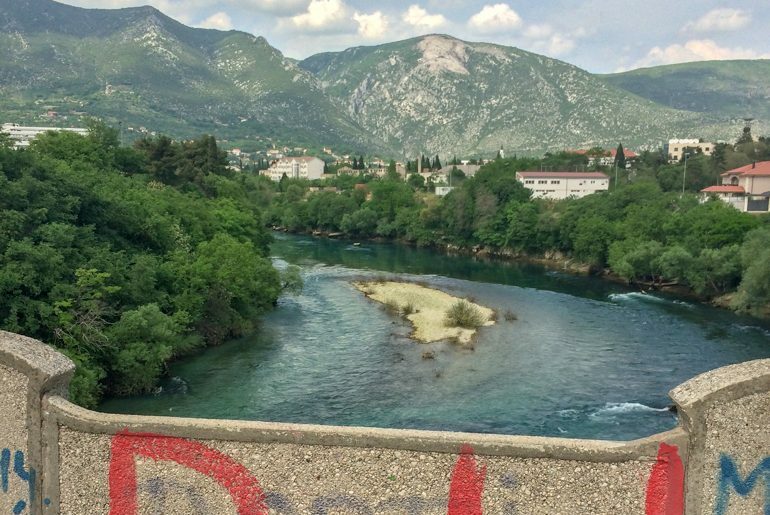 Whereas in Mostar, the city is physically divided by the river and tensions still linger years later. Our guesthouse host family spoke about the differences in the town. While there is no outright danger to one another, there is certainly a divide. Even the schools on either side of the river are segregated – with the exception of one – the United World College. With a large percentage of Bosnia being Muslim, there are mosques dotting the countryside. At night, you hear the call to prayer in Sarajevo. We’re not religious but it was interesting to be surrounded by a different belief than we are used to. For you, the traveller, you can experience all sides of the story and be respectful to all beliefs, even if you don’t agree. If you are entering a place of worship, don’t be afraid to ask if you are dressed correctly. Some mosques require shoes off and women to be covered, while we’ve read that other ones don’t require tourists to do so because they are visiting and not intending to worship while there. Pljeskavica is a Balkan/Serbian hamburger. Similar meat to cevapi – different form! Ugh – Bosnian food is such a sore spot for us. So delicious and often unhealthy – but good. The Balkan region, in general, has a reliance on grilled meat, pastries, and fresh vegetables. The region is known for cevapi. Cevapi is a mixed meat sausage that is made and done slightly differently depending on the country. 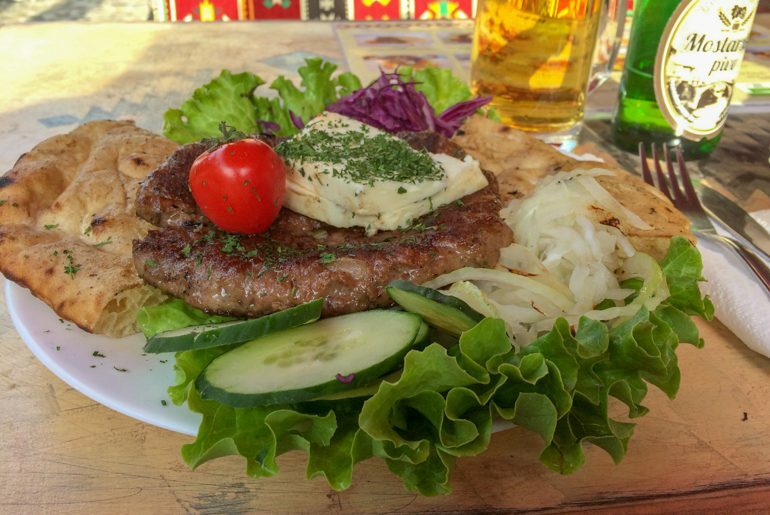 Cevapi is a huge deal in Sarajevo – with cevapi restaurants serving ONLY cevapi with onions and yogurt inside a pita. We’re writing a post on food in Sarajevo as we speak so watch out for that! In Mostar, we ate a ton of burek. Burek is a Balkan pastry filled with either meat, cheese, or spinach. It is also so delicious when hot and fresh. It made the perfect breakfast – but we also ate a ton of burek in Ulcinj, Montenegro. We digress. Many of the restaurants in Mostar had lots of vegetarian options and, having seen people order them, the salads and grilled veggie platters looked amazing. In short, there are plenty of traditional food options as well as food options you might be used to in more established Western restaurants. We advise you to try new things when you’re in Bosnian at least once! And there you have it, our first impressions and a few need-to-knows about Bosnia and Herzegovina. Admittedly, we only got a sample of the country but we are SO glad we stopped through. We cannot wait to go back to rent a car and take the time to explore even more of the country. What do you think? Have you been? Get in touch and let us know!